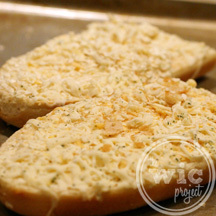 Fun Family Night with Schwan's Home Service - Review & Giveaway | The WiC Project - Faith. Free Giveaways. Product Reviews. Recipes. Life is busy. At some point or another, we have too many errands in too littler time. Honestly, there are times when I’m so pooped, the last thing I want to do is prepare a decent meal. Sadly, that usually means something fast, fried, and unhealthy. Tonight, my eyes were opened to a new way of cooking when I tried some meals from Schwan’s. Put the spatula down and let us do the cooking for you this Friday night (or any night of the week). Why? Because when the week is almost over the last thing you want to think about is preparing dinner for the family, as you do night in and out! Well, we have good news: Schwan’s Home Service gives you a break in the kitchen, with entrees, sides and desserts all ready in minutes! How did I now learn about Schwan’s until now? Schwan’s Home Service is a great and super easy way to serve delicious meals for yourself or for your family. My Schwan’s dinner arrived in a styrofoam box, still completely frozen thanks to the dry ice packed inside. Contents: the new Fresco By Scotto Baked Ziti, Five Cheese Garlic French Bread, Broccoli Florets, and Chocolate Ice Cream. Everything went into the freezer until a night, like tonight, presented itself. A night where time was short, it was getting late, and I was desperate for a quick meal. And when I type quick, I mean that in just 15 minutes, I had cooked and plated the entire Schwan’s dinner. 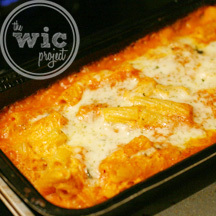 I decided to cook the Fresco by Scotto Baked Ziti using the microbake method. 7 minutes in the microwave and then 8 minutes in the oven. While the ziti was in the microwave for the first 7 minutes, I threw the Five Cheese Garlic French Bread into the oven for the start of it’s 15 minutes of baking. Since both the garlic bread and the ziti baked at the same temperature, the cook times and temperatures worked out perfectly. There are six pieces of garlic bread in the box – I decided to cook only two, which was easy to do since the bread is individually wrapped. You could probably stretch it even further because I think one piece of the bread could comfortably serve 2 or 3 people. Of course, you have to finish up your dinner with dessert. 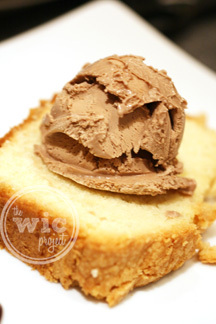 I happily scooped out some chocolate ice cream onto the pound cake I made late last week. Doesn’t that all look delicious? Here’s a quick breakdown of the meal. Fresco by Scotto Baked Ziti – “Hearty classic baked ziti, tossed with a 3-cheese combination of Ricotta, Parmesan and Mozzarella, smothered in flavorful rich tomato sauce. Bake it in the oven until golden brown and bubbling hot, and enjoy a dish, just like Grandma’s homemade!” Price – $10.81, serves 2. This tray is supposed to serve 2 people, but realistically it could probably serve 4 people. The pasta cooked up perfectly. I loved that it wasn’t overly-cheese (even with three types of cheese) and the sauce was delicious. 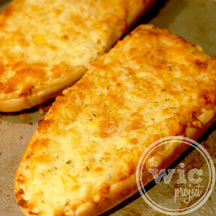 Five Cheese Garlic French Bread – “Crisp and tender French loaves are sliced in half and generously topped with sweet roasted garlic and five big cheese flavors—Mozzarella, Provolone, white and yellow Cheddars and tangy Romano.” Price – $8.73, serves 6. The garlic bread was amazing. The bread cooked up perfectly, meaning the crust was crispy but the inside was soft (but not mushy). It had the perfect amount of cheese and a very nice garlic flavor. As I mentioned earlier, the pieces are fairly large and you could probably serve at least 12 people with one box, making it a great party appetizer option. Broccoli Florets – “Our Grade A, 100% Broccoli Florets are easily added to recipes, or served alongside any main dish. 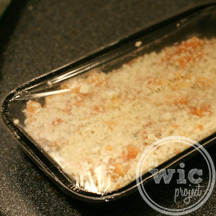 Top with garlic-infused olive oil and a sprinkle of Parmesan cheese. Conveniently packaged in a re-sealable bag.” 1.5 lb bag, Price – $4.73, serves 8. Sometimes the broccoli at my grocery store looks sad and wilted. The frozen Broccoli Florets are a great option to make sure I get my vegetables. I cooked them in a bowl in the microwave and they cooked up great – just the right amount of tenderness and still had a great fresh taste. I didn’t even need to add seasoning! With such a large bag, I was able to just pour out the broccoli I wanted for tonight, and then freeze the rest for later. Chocolate Ice Cream – “Rich and creamy, mellow and smooth, this slow-churned milk chocolate ice cream is the chocolate purist’s choice.” Price – $5.36, serves 14. I’m usually not a chocolate ice cream fan, but Schwan’s Chocolate Ice Cream was very, very good. It was smooth and creamy with a nice, light chocolate flavor. Are you feeling hungry yet? If you’d like to make some of your meal times about a billion times easier, then I would definitely suggest you take a gander at Schwan’s Home Service. The meals are reasonably priced and they have tons of meal options, including more meals from Fresco by Scotto, such as Penne alla Vodka with Chicken or Fuscilli with Seasoned Vegetables. Overall, I am amazed and surprised by how much I liked the Schwan’s meals. The flavors were great and the entire dinner was easy to prepare in a short amount of time. I’m actually going to go through the site now to pick up some back-up meals to keep in the freezer. If you have any recommendations, please let me know! 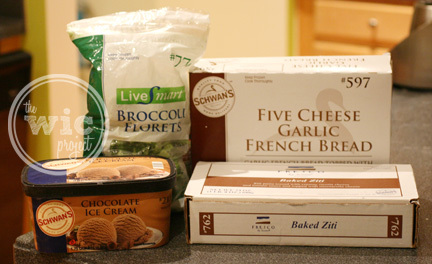 One winner will receive the Schwan’s Home Service meal package I reviewed above, which includes the new Fresco by Scotto Baked Ziti, Five Cheese Garlic French Bread, MicrosSteam Baby Broccoli Florets and Chocolate Ice Cream. 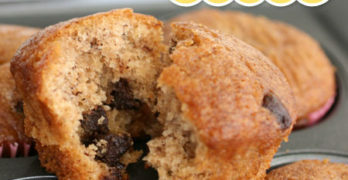 Visit www.schwans.com and leave a comment with the food item you want to try the most. Giveaway ends at 11:59 PM EST, April 6, 2011. I’d love to try their seasoned steak bites and deep dish pepperoni pan pizza! I would try the Tri Colored Torellini or the Chicken Cordon Blue. I subscribe via email & follow on FB! I would like to try their Thai Coconut Soup. I subcribe via email – thanks again! I’d like to try the beef tips in gravy. I follow Schwan’s on twitter as humanecats. I follow on GFC as Ericka T and RSS in Google reader. I would love to try the Salmon Burgers. I always wanhted to try the pasta stuffed with cheese shells! Looks so good! I’d like to try the Beef Merlot Wine Country Dish. Being a fan of both seafood and burgers, I’d love to try their Salmon Burger! I would like to try the Lemon Butter Shrimp! I really want to try the Cheese and Herb Biscuits and the Apple Streusel Dessert. Wow – I didn’t realize they had Sushi. I’d like to try the Shrimp Scampi. Thank you for the chance to win! I would like to try the Canadian Bacon Pizza. I would like to try the silvermint bars. Quesadilla Cornucopia with Smoked Chicken! I would love to try the Cream Cheese Wontons. The Chicken Alfredo Rigatoni Meal Kit sounds awesome too!! I would like to try the Creamy Shrimp Scampi with Linguini. I follow The WiC Project on GFC as Helen Keeler. I really want to try the Coconut Shrimp! I’d most like to try the Maryland Style Crab Cakes! Thanks. I want to try their Tamales the most. I’d like to try the Wine & Garlic Flat-iron Steaks. The Double Layer Chocolate Cake – yum! I’d love to try their chocolate marshmallow ice cream deliciousness! The Roasted Garlic and Chicken Flatbread Pizza sounds yummy! I would love to try the cheese balls appetizer. I want to try their Chicken Cordon Bleu. YUM! I would like the Sliced Beef with Mashed Potatoes. And thirdly, of course I’m subscribed to your blog! I would like to try the LiveSmart Lemon Butter Shrimp. I’d love to try the Schwan’s Wine Country Classics Beef Merlot. So many yummy-looking options, but I think I would choose the Chicken Alfredo Rigatoni Meal Kit. I want to try the meat lasagna. +i have had their icecream products before…yummy. but never tried their meals. i would like to tyr their easter ham to make my easter gathering with family and friends alittle more special. I’d like to try the salmon burgers. Thanks. Like WIC Project on FB (Contest KAO). Thanks. Everything looks so good. But I think I would try the Schwan’s Wine Country Classics™ Sweet Bourbon Glazed Chicken first. I have always wanted to try Schwan’s products. I love Schwans! I would love to try to try their 5 cheese flatbread pizza. I loved those individual pizzas when I was in high school! I “like” Schwans on FB now. I would love to try the beef merlot! I follow Schwans on Twitter (@skkorman)! I like the WIC Project on Facebook (Sheila Korman)! Mmm I would love the Salmon burgers. I’d most like to try the Shrimp Scampi! I “Like” The WiC Project on Facebook and am a subscriber. 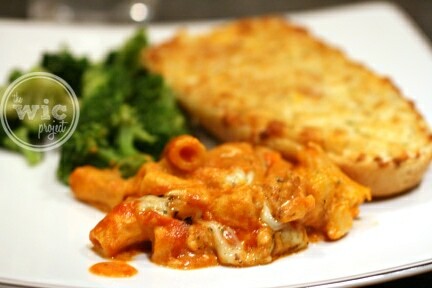 The Fresco by Scotto Baked Pasta with Spinach & Mushrooms looks so yum. Thanks. Yummy! Thanks for the chance! 🙂 I would love to try their Salmon Burgers. I like Schwan’s on Facebook (username: Les Cerises). I’d like to try Fettuccini Alfredo with Chicken and Broccoli. I’d love to try Schwan’s Breaded Mozerella Sticks. I like all their fish items. Thanks for the giveaway. I would love to try the cheese stuffed pretzels! Yum! I’d love to try their sliced ham. 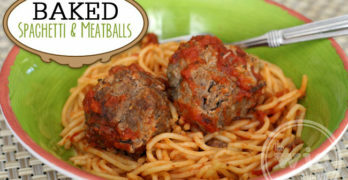 Ooh, I would love to try their Italian Style Meatballs! I really want to try the Sweet Bourbon Glazed Chicken! I would like to try the bourbon glazed chicken. Fresco by Scotto® Chicken Parmesan sounds like waht I want to see for dinner tonight. I’d like to try the crab cakes. I would like to try the beef merlot. Like Schwan’s on FB- Mary Jaco. Here’s mine: SCHWAN’S® Fire Baked Spinach & Mushroom Pizza. Following Schwans on twitter as ky2here1. Shrimp Scampi. Thanks for the giveaway. I would love to try the grasshopper pie! The baby bakers look yummy too. I’d love to try their Chicken Enchilada Dinner! The Decadent Chocolate Ice Cream Pizza looks mouth watering! I would love to try the black angus steak burgers! Would love to try the decadent chocolate ice cream pizza! I would love to try the Fresco by Scotto® Lasagna with Meatball Sauce . Deep Dish Pepperoni Pan Pizza would be my item of choice! I would like to try the Salmon Burgers. I’ve always wanted to try out Schwans – they drive down my street all the time. Some people hate it, but I love it – I’d try out their Meatloaf first (http://www.schwans.com/products/productDetail.aspx?id=58131&c1=10428)! Thanks for the giveaway. The Alaskan Salmon looks good. I would like to try the Au Gratin Potatoes. The Wine Country Classics Sweet Bourbon Glazed Chicken sounds wonderful! I like Schwans on facebook & I like (love) the Chocolate Malt Twist icecream. I would LOVE to try the Bourbon Chicken..YUMMY!! The double lemon supreme pie! Great giveaway! I would like to try the Alaska Salmon. I’d love to try the Shrimp and Broccoli Alfredo. Thanks for the giveaway! Peach Pie is my favorite- I would like to try Schwan’s Peach Pie. I would try the Chicken Pot Pie- Everything on the Schwans website looks tasty! 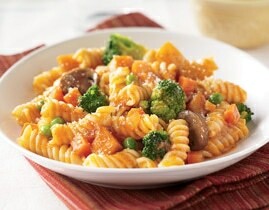 I would love to try the Fuscilli with Seasoned Vegetables! The picture looks soooooo yummy! I would like to try their Shrimp Pad Thai. I would have never guessed they had such a wide variety of foods! I’d love to try the “Maryland Style Crab Cakes”, yum! I want to try the Chicken Enchilada. Thanks. I would try the deep dish cheese pizza! I would love to try the Buffalo chicken dip! The Decadent Chocolate Ice Cream Pizza looks sooooo good! I’d like to try the Seasoned Stuffed Chicken Breast. I’d love to try the Wine Country Classics Beef Merlot. Thanks!! I want to try the Beef Portobello Dinner. I’d like 2 try the Fully Cooked Angus Meatloaf . follow all the above on either FB or twitter.